We’d love your help. 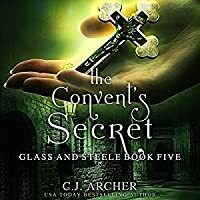 Let us know what’s wrong with this preview of The Convent's Secret by C.J. Archer. To find the one man who can fix the magic in Matt's watch, he and India are led to a convent where the nuns will do anything to keep their secrets private. Including murder? Matt and India must uncover the truth behind the disappearance of the mother superior and two babies given to her care many years ago. But sometimes, the truth is painful and its exposure can have dead To find the one man who can fix the magic in Matt's watch, he and India are led to a convent where the nuns will do anything to keep their secrets private. Including murder? Matt and India must uncover the truth behind the disappearance of the mother superior and two babies given to her care many years ago. But sometimes, the truth is painful and its exposure can have deadly consequences. To ask other readers questions about The Convent's Secret, please sign up. I love India and Matt. This series was my 1st by the author and since I read the first one, I have pretty much devoured everything she's written, and love it all, but Matt and India will always be special to me. Their banter, their back and forth, the female struggles for independence in the 1800s. It is all amazingly wrapped up in a set of lovely paranormal mysteries that keep you guessing but don't ever feel rushed or false. Her writing is a joy. I can't wait for the next in the series. Oh the tension, the suspense! Stayed up to read it because I couldn’t put it down. India’s secret is almost out and I can tell it will cause more problems and heartaches. Lots of action, romance, and magic. I think this is my favorite of the series so far, and that’s saying a lot. I like the side plot stories she’s developing, even a possible new suitor for India (although we all know there is no one for her but Matt). Ms. Archer has never steered her readers wrong, so I’ll trust that s Best Yet! Oh the tension, the suspense! Stayed up to read it because I couldn’t put it down. India’s secret is almost out and I can tell it will cause more problems and heartaches. Lots of action, romance, and magic. I think this is my favorite of the series so far, and that’s saying a lot. I like the side plot stories she’s developing, even a possible new suitor for India (although we all know there is no one for her but Matt). Ms. Archer has never steered her readers wrong, so I’ll trust that she gets India and Matt out if any trouble she puts them in and make them better for it. Read it now! I was glad the main story arc has been resolved. I'm wasn't enthusiastic over the ending or the turn the series is taking. Matt is being blackmailed to marry his cousin. His Aunt and other relatives keep reminding India she's not good enough. India needs to woman up and tell them to shut up. Matt needs to set them all straight. His relatives have been trying to trap him for 5 books and I'm tired of it. Matt hopes that he'll find a way out of marrying his cousin so he and India can be together. I I was glad the main story arc has been resolved. I'm wasn't enthusiastic over the ending or the turn the series is taking. Matt is being blackmailed to marry his cousin. His Aunt and other relatives keep reminding India she's not good enough. India needs to woman up and tell them to shut up. Matt needs to set them all straight. His relatives have been trying to trap him for 5 books and I'm tired of it. Matt hopes that he'll find a way out of marrying his cousin so he and India can be together. If the next book centers around familial angst I don't think I'll read it. I love Matt and India together, I like the mystery. The stories are better when Matt and India can work together to solve mysteries without the emotional distractions. My main complaint about this series is the excessive interference from Matt's English family. Constantly trying to force Matt to marry one of his cousins (His uncle's daughters) in order to keep the estate within the family and to insure they always have a home. We found out in the previous book that Patience once had a dalliance with a man and this could cause her current fiancé to break the engagement, if he finds out. Of course Sheriff Payne is hell bent on ruining Matt and he'll use any family member or friend to do it. When Patience's fiancé does find out, his uncle forces Matt to marry her because he said all this is Matt's fault. He's also holding something over Matt's head. All that had my eyes rolling because the person who's responsible for all this is Patience...but Matt has to pay the price. It really bothers me that Matt has no backbone in this matter. I'M SO STRESSED WHERE IS THE NEXT BOOK?! What's better than reading a new book from one of the series you adore? For me, not much. I love how the author creates complex mysteries with seemingly random details that make so much sense in the end. I rarely know who's the killer in any of her books. So, 'The Convent's Secret' brings some much needed answers and conclusions, while also presenting new problems and, in my case, frustrating situations. God, I really hate this time period where people, especially women, can't don whatever the hell they want with their lives! I'm really curious, and excited , to see what the next book will be about since the main problem in the book has been resolved. It seems like it would focus on Matt and India's relationship, in which case I'm so in . 'The Ministry of Curiosities' and 'Glass and Steele' are two of my favorite series and I hope the author will continue to feed my addiction to her books. Another brilliant Glass and Steel book. A bit of a nail biter this time. When it was getting to the end I presumed it would be the last in the series (can't give any spoilers). Thankfully there will be another book to follow. I loved this book as I enjoyed all those leading up to it. I was on the edge of my seat wondering what was going to befall Matt and India next. Can't go any further owing to spoilers but it's a wicked tale! Bah! I read The Convent’s Secret way too fast. I swear, one minute I opened my Kindle to read and the next, I was done. Now I have to wait until the next book comes out. There has to be a legit word or group of words that describes these flu-like symptoms a reader gets during the wait between books in a series. Series sickness maybe? When is the next damn book coming out syndrome? Of course, C.J. Archer ended this addition of the Glass and Steele series with a moment that had me giddy as a girl an Bah! I read The Convent’s Secret way too fast. I swear, one minute I opened my Kindle to read and the next, I was done. Now I have to wait until the next book comes out. There has to be a legit word or group of words that describes these flu-like symptoms a reader gets during the wait between books in a series. Of course, C.J. Archer ended this addition of the Glass and Steele series with a moment that had me giddy as a girl and freaking livid, almost ugly crying, that it was over. For me, The Covent’s Secret read differently than the others. There wasn’t nearly as much action and adventure, but the story seemed more solid. I think it’s because I felt the other ones had scenes and dialogue that really didn’t need to be there; it was extra fun stuff to read. This one didn’t have those scenes; every single scene felt like it belonged. I enjoyed it immensely. I am hooked on this series with all the great writing and characters that come to life. Archer is one fine storyteller. It is Spring of 1890,London. Glass and Steele are still trying to find the man who can fix the magic watch. They are led to a convent where they soon learn that the nuns will do anything to keep their secrets...awesome read. This review has been hidden because it contains spoilers. To view it, click here. The Convent's Secret eventually helped solve Matt and India's problem. But it fell flat. Lots of character development within the small group in 16 Park St, but the mystery part was not as mysterious. I've always been a fan of CJ Archer, but I think Glass and Steele is becoming my favorite of her series. There's mystery, magic, humour, a little romance, and some fantastic characters. The Convent's Secret has answered a few questions and left us with more. Looking forward to book 6. Just love this series, has all my bells and whistles, period novel, w/ "odd" or "unusual characters", mystery, action, bot of romance, and a bit of the paranormal! I sure hope my friend has book #6, as my library don't carry C. J. 's books, if you can imagine that. A conclusion is reached in this one for Matt, and now they have decisions to make moving forward. I devour these as soon as they are released! Quality writing, quirky but well developed characters, and an engaging storyline. Can’t wait for the next one...hurry up! I truly love CJ's way of just pulling you into her world's magic and intrigue. She always leaves me waiting on kind and needles for the next book in each series. I was really hoping everything would be resolved in this book and was annoyed at yet another set of obstacles keeping Matt and India from getting Matts watch fixed. I was soo tired of Matt and India going back to the convent yet again with more questions-argh! But perhaps that's exactly what the author wants me to feel - dispirited, sad, lack of hope, anger, worry, frustration. If so, well done! I was very happy there was a resolution to one of the major plot lines but equally disappointed that I was really hoping everything would be resolved in this book and was annoyed at yet another set of obstacles keeping Matt and India from getting Matts watch fixed. I was soo tired of Matt and India going back to the convent yet again with more questions-argh! But perhaps that's exactly what the author wants me to feel - dispirited, sad, lack of hope, anger, worry, frustration. If so, well done! C.J. Archer spins a marvelous yarn involving crime, intrigue, mystery, romance and magic all which will keep the reader captive right through the end! The characters are very well defined and will give the reader a feeling of being part of the story! Not only an excellent book, but an equally excellent series! This review has been hidden because it contains spoilers. To view it, click here. Well, I'm very relieved that the story of finding the medical magician was wrapped up because it was dragging on for far too long. What started off as a great story really should have ended after book three. Five books of India and Matt looking for people was incredibly excessive. As much as I wanted to love this series, I think I'm finally calling it quits after book 5. The mystery wasn’t bad, but the over-arching mystery is moving very slowly and has been needlessly drawn out to another book. I just realized that the books have been published about every six months. With their short length, they don’t need to be serialized like this. But perhaps they’re meant to be, to make them more steampunk or something? Oh, dear, where to start with this one. It was good, as all the previous books were, and it did manage to up the ante towards the end—in more ways than one. But...this book took a dip for me early on. (view spoiler)[ There was a certain situation that cropped up that I feel didn’t have to be there—and it has nothing to do with me wanting Duke and Willie to get together...again, as it turns out. Here we find out that Willie is bisexual and I’m not going to argue with that—too much—because it certa Oh, dear, where to start with this one. It was good, as all the previous books were, and it did manage to up the ante towards the end—in more ways than one. But...this book took a dip for me early on. (view spoiler)[ There was a certain situation that cropped up that I feel didn’t have to be there—and it has nothing to do with me wanting Duke and Willie to get together...again, as it turns out. Here we find out that Willie is bisexual and I’m not going to argue with that—too much—because it certainly happened throughout history. I just felt like it didn’t need to be in this story and that the author is skirting all the things that are driving me up the wall right now with books and real life. I’ll give credit to the author and that it’s been so ewhat subtle, but the real issue I had was the fact that every in Matt’s circle is okay with this. It’s not natural for the time period. When India discovers this about Willie, she agrees with it rather quickly—it was the same issue I had with her immediate reaction to Matt’s magic watch; before the doubting phase and trying to reason away magic—which should’ve been present from the beginning. The believability takes a dip for me and I don’t particularly like that, imo. But the story made up for that eyeroll. Yes, I really did eyeroll. I liked the mystery and the payoff at the end. I liked that India is still learning about her magic and that she is not the only strong magician around; that would’ve been a little too Mary Sue. A mpMary Sue to match Matt’s Gary Stu at the moment. Of course, Matt isn’t always right, but it seems like he’s right in all the areas that matter and it’d be nice to have him be wrong once. The slow burn between Matt and India is a full blown fire now and despite the drizzle they’re facing right now—gotta love that England “rain”—I’m sure the fire will withstand what “Mother Nature” throws at them. I’m still hoping Letitia will come around, but I’m not sure she will now. We didn’t see much of Cyclops and Catherine in this one, but there is a lot of jabbing and smirking at Cyclop’s benefit. It may happen yet. And Duke and Willie? Well, I give up on that one. The author is too confusing where they’re concerned. Oscar Barratt has taken a dip in liability for me; and I barely liked him to begin with. He’s definitely proven that he values the job (and sensationalism) more than friends and potential love interests. He’s going to end up a confirmed bachelor, I’ve no doubt about that. It almost serves him right. Overall, the book was good, fast paced in places which added to the excitement, and with minor grammar errors. I’m still wishing for the Oxford comma though. I give the book a 4.8-stars because I really did feel there was an unnecessary addition. I will definitely recommend the book. 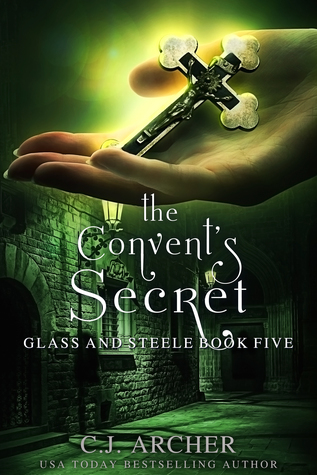 The Convent’s Secret is the fifth book in the Glass and Steele series. When I made the decision to start doing book reviews, I’d already read the first four in the series and fallen head over heels in love with the characters. So, when I learned yet another book would be out soon, I was already poking the want button. Probably a lot harder than I should. Maybe even beating it with a hammer. One of my favorite things about reading this book (and the series) is that Archer has a way of writing in first person that makes it feel like third person. While I’ll read both, I prefer the latter, which allows me to connect with all the other characters on a deeper level. Matthew Glass is seriously book boyfriend number two, a close second to Ridge from the Dragon Blood series. I love everything about his personality, from the rugged outlaw persona to the gentle heartbreaker. Even though Matt has a gentle side, it has an endearing quality without coming across as cheesy. Though, for those who know me, I’m a sucker for darker personas and love the outlaw side of him. The romance in this story had me by the throat before the first chapter was over. Granted, I’ve followed the series and was already invested, but the deeper it got into the tale, the harder it became to watch the division happening between India and Matt. In all honesty, this book is pretty stellar as-is. If I had to be super nit-picky, I’d say that the finale was pretty predictable. I won’t give away spoilers here, but in my head I already knew x, y, and z would happen so there weren’t any real surprises. India and Matt are running out of time. They have to find the healing magician in order to fix Matts watch, or he will die. It continues to become weaker and soon enough, it will cease to work at all. When clues point them to a local convent, Matt and India investigate. The nuns are tight lipped, but they are able to discover that twenty years Back with book 5 in the Glass and Steele series and ya’ll, I could serious read these characters and this world for the rest of my life and not be bored. India and Matt are running out of time. They have to find the healing magician in order to fix Matts watch, or he will die. It continues to become weaker and soon enough, it will cease to work at all. When clues point them to a local convent, Matt and India investigate. The nuns are tight lipped, but they are able to discover that twenty years ago, two infants and the Mother Superior went missing. With the convent actively thwarting their attempts at digging up information, an old enemy intent on taking Matt out, and a family matter that threatens India and Matts happiness together, the sleuthing duo have no shortage of problems to solve and people to beware of. Incredibly worthwhile series. I noticed little things about India that bothered me yet again this book and some other strange things that came up to annoy me, but overall very well done. I will definitely be reading the next one when it comes out. Spoilers ahead, don’t continue if you don’t want to read spoilers! India was extremely positive all through the earlier books that she would not marry Matt. She made her reasoning plain, though she loved him. T Incredibly worthwhile series. I noticed little things about India that bothered me yet again this book and some other strange things that came up to annoy me, but overall very well done. I will definitely be reading the next one when it comes out. India was extremely positive all through the earlier books that she would not marry Matt. She made her reasoning plain, though she loved him. Then her reasoning seemed to change or dissolve suddenly when Matt was finally healthy again. Though the reasons that were in the book before he was healthy had absolutely nothing to do with his health, when he finally was well again she forgot all about them in a moment and wanted to marry him. Of course, now he can’t marry her so there is still a reason for the author to keep them apart. Honestly, what happened to the person I thought India was? Is it that simply having him healthy and in love and unable to marry her suddenly equals forgetting every reason she had to keep them apart before now? While the narration still manage to engage in the collateral mistery, there was absolutely no need to drag the main quest resolution for so long. No need for two whole chapters involving Sheriff Payne as a lead. No need for Matt to (almost) die This time I'm disappointed. No need for Matt to (almost) die a third time in a row, and he being able to do all that stuff while on the brink of death felt very forced. (view spoiler)[As well as Chronos' reappearance (hide spoiler)]. What annoyed me further is the ending: that is not an epilogue. (view spoiler)[ While I suspect Lord Rycroft of blackmailing Matt with something about India and her abilities, while it is in character with the era, (hide spoiler)] this new vague impediment to the main couple finally being together - when everybody knows is going to happen anyway - is a deliberate attempt to just sell one more book. From the moment I picked up the first book in this incredible series I have not been able to put it down and have even purchased the remaining books to date in the series as I simply want more. CJ Archer writes about amazing characters that you will fall in love with and no matter what you will love them. I was always a little weary of reading about stories set in this era (late 1800 early 1900's) but it has been a wonderful setting, a time when life for women was very different to now, but made so compelling by giving the reader such wonderful strong resilient females characters. I love the series. Each book has held my interest from page one through the last line of the final chapter. Once I start the book, it only takes me one to two days to finish. Hard to put down. Looking forward to the next book. I also read the book(s) and enjoyed them very much. There are characters you like and some you will despise. There are parts that will make you laugh. My only complain is there is not enough closure. It may be your intentions but it has become a long running "Soap I love the series. Each book has held my interest from page one through the last line of the final chapter. Once I start the book, it only takes me one to two days to finish. Hard to put down. Looking forward to the next book. I also read the book(s) and enjoyed them very much. There are characters you like and some you will despise. There are parts that will make you laugh. My only complain is there is not enough closure. It may be your intentions but it has become a long running "Soap Opera". Sorry to say I am not a fan of soap operas. This may be my last Glass and Steel book. This was another quick but very exciting read. Matt and India are still on the hunt for the physician. Willie's mystery is finally revealed. More complications arise for Matt and India's romance but India has at least let go of her reservations about herself being an "inappropriate" match for him. Sheriff Payne makes an appearance. Overall, I really enjoyed this book. We do get some closure, of sorts, but there is at least one more story yet to come and I am OK with that. I am happy wit So close! I found this series a little late- but I devoured the first three books in a week and have per-ordered every one since then. I'm not one to overthink books when I read them. I read to escape and enjoy a break from the stresses of life. This series is a perfect get away. The characters are lovable and witty. The author pulls together suspense and romance while also keeping it light and fun. I've enjoyed following them from book to book and can't wait for the next! I highly recommend these if you w I found this series a little late- but I devoured the first three books in a week and have per-ordered every one since then.